It’s amazing how one’s priorities change with a baby. After the arrival of Baby G, my priorities in life have certainly changed. Everything I do, and in this case, what I eat, is for the benefits of my child as I am breastfeeding my baby. My diet has transformed into what is healthy and nutritious for him; it’s no longer all about what I enjoy eating, well, at least for now. When I started breastfeeding, I have learned that salmon is rich in omega-3 fatty acid and DHA, a very important nutrient for developing the brain of babies. Norwegian Salmon is Ocean-Farmed Atlantic salmon. Norwegian Salmon is Atlantic Salmon bred in Norway’s clean, cold fjords and coastal seawaters and hence features a fresh and smooth flavor that is enjoyed in more than 100 countries worldwide. And most importantly, Norwegian salmon is safe to eat, sustainable, and raised with care and meticulous attention by seasoned experts drawing on generations of traditions. The Norwegian Salmon were flown in to me. I just loved the natural pinkish-red color of the salmon and it was very fresh. I made a steamed salmon dish that was simple, light, and healthy, with dashi stock as the base and garnish it with a fresh shiitake mushroom and a broccoli floret. The delicate flavor of the Norwegian Salmon really came through and I really enjoyed eating it. For more information about Norwegian Salmon, please check out its website. You can also find out more information about Norwegian Salmon here. Remove the scales of the salmon and clean it thoroughly. Pat dry with paper towels. Arrange the salmon, one shiitake mushroom and one broccoli floret on a deep dish. Prepare the dashi stock by bringing to boil the dashi. Add the mirin, sake, and soy sauce. Remove from the heat and set aside. Steam the salmon for about 3-4 minutes or until it's cooked. Discard the cloudy fish water in the dish. Pour half the dashi stock into the serving dish and serve immediately with steamed white rice. Repeat the same for the remaining salmon and the other ingredients. Please click here for the dashi recipe. 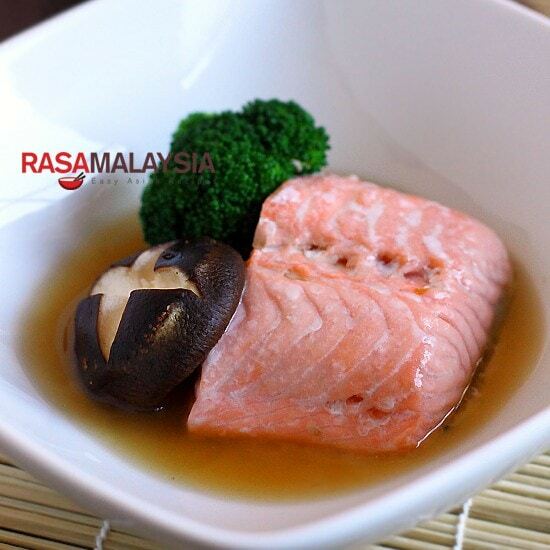 It’s a wonderful idea to steam salmon with dashi stock. I can imagine the subtle taste of this dish. I love Norwegian Salmon. It’s the only salmon I buy from the market. Glad that you like the idea of dashi stock as the base! How can you tell if a fish is fresh at the market? The fish is fresh if the flesh is firm to the touch and it doesn’t smell fishy, also, the flesh should look pinkish or orange in color and not with a greyish hue. You are a wonderful mother for your baby to consider what to eat, he is such a lucky guy.I read about the health benefits of salmon and I’ve been cooking it more often since then.I don’t know many recipes of it though. I either grill it or cook it in oven with sliced onions. This steamed salmon looks just amazing! Would love to try this recipe, but I’m not sure if I can find all the ingredients in my area, Turkey. Maybe I can combine it with broccoli and mushroom only. Thanks anyway! Zerrin – thanks for your sweet note. I like the idea of steaming the fish to retain all its nutrients. Can we find Norwegian Salmon in Penang? I am not sure, I have seen salmon at Batu Lanchang but not sure where it’s from! I would still worry about eating too much salmon while breastfeeding. Even if Norwegian Fjords are “clean”, not all the salmon’s food source can be proved to be mercury free. I only mention this because my wife and I did a bit of research just 18 mos ago for our little one. Hi Tom, thanks for your note of caution! Wow, I love such sides which have a few simple ingredients and clear n crisp flavors! Looks really good Bee! Wow bee, I feel honored to see you prepare something from my very close sea. Incorporating asian flavors with something from the beautiful north is nice. Actually, one of our largest export next to metal music is salmon. We export a lot of salmon to Japan and china in fact. It’s great that you teach your little fellah from the first times in his life to eat healthy. It’s such a sad thing seeing how parents string kids along to McDonalds for breakfast. As for the person asking about salmon in Penang: I don’t know what kind or import/export relations you have with norway, or if you get anything from norway through Japan. That looks like a great dish…..soooo refreshing and healthy! I am staying in Austria and can get Norwegian Salmon and will try the recipe today. Love your ideas. Nice piece of salmon and steaming is just a great method to eat fish! My sis and I love salmon. I’ll have to try this soon — we usually love them pan-fried or baked. Hi, I’ve just had salmon for dinner tonight. panfried plain. On the side, I had Russet potatoes (sliced), stirfried with onions in oyster sauce drizzled with sesame oil. Simple, quick and delicious. I just stumbled onto you site and love it! I have a little one at home too – almost 2 years old and we live in Irvine too! I have been going to the Newport Beach pier every weekend to get fresh black cod and red snapper for us to steam. Do you got to the UCI Farmer’s market? I love their organic Asian veggies, just like the ones I ate growing up. No McDonald’s for baby here. :) Can you tell me where you got the Norwegian Salmon from? We live right by Wholefoods, but thought you might know of a better place. Thanks for your recommendations of places to shop. For the salmon, it’s flown in to me. Get your head out from under the sand. The truth is ugly. Eat whatever you like, I don’t care, but stop telling outright lies. er, frankly i’ll advise against eating any type of farmed salmon (which norwegian mostly is) unless you have proof of their husbandry practices. for the same reasons as any type of industrially farmed meat should be avoided. the hormones, antibiotics, etc also tend to accumulate in the fat of an animal, and can get to high levels (bioaccumulation). so if you must eat farmed fish, lean is still better. save your money for wild caught fatty fish; the prices sometimes don’t differ much. or take fish oil. much cheaper than being conned by the fish industry. Also, other wild caught/ free range animals have higher levels of beneficial fats too; you don’t have to rely on fatty fish.